A delegation of United Garo Autonomous Council Movement Committee calling on Assam CM Sarbananda Sonowal on Tuesday. A delegation of the Assam State committee of the United Garo Autonomous Council Movement Committee (UGACMC) on Tuesday called on Assam Chief Minister Sarbananda Sonowal and discussed with him regarding creation of a Garo Autonomous Council in Assam on satellite basis. The UGACMC has demanded that a separate satellite autonomous council be formed for the Garos living in Assam. They also threatened to boycott the coming parliamentary polls if their demand is not fulfilled. “The Garo people are the second largest ethnic tribe after the Bodo community in Assam. Garos are the largest tribe in the Rabha Hasong Autonomous Council (RHAC) outnumbering the number of the Rabha community itself,” the UGACMC stated in a press communique jointly issued by Alex K. Sangma, chairman and Thengsil Sangma, general secretary of the organisation on Wednesday. The UGACMC, headquatered in Goalpara, claimed that only by fulfilling the demand of a “separate Garo Autonomous Council in Assam can address the aspirations of the Garo community in Assam where they covet to preserve their unique culture, tradition and language”. The Scheduled Tribe status for the Garo people living in the plain district of Assam was granted in 2003, since then various Garo organisations have been demanding grant of a separate autonomous council for them. The infrastructural, social, agricultural development in the Rabhas and the Bodos inhabited area is way ahead than that area inhabited by the Garos. “The Garo areas have been the most neglected part of Assam by successive governments. The Garo people of Assam have been receiving a step motherly treatment since independence and has seen no proper investment for overall development in Garo areas,” it added. 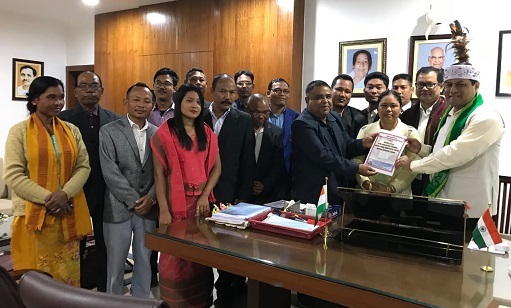 The organisation further stated that there has been improper utilization of allocated funds which in itself is meagre and “insufficient” for implementation of schemes in the Garo areas. “This imbalance and backwardness can only be redressed by the creation of separate Garo Autonomous Council(GAC) where the Garos can set up and determine their own developmental goals and fulfill their cultural, traditional and linguistic aspirations,” it further said. The UGACMC on behalf of the entire Garo community of Assam demanded an early written assurance from the Government of Assam for the creation of a Garo Autonomous council and stated that failing to fulfil this demand would compel them to call a comprehensive boycott of the upcoming parliamentary election in 2019 and intensify agitation in various ways until our demands are met.